Few enemies in Dungeons & Dragons are as iconic as the many-eyed, floating ball of magical annihilation known as the Beholder. If your adventuring party ever crosses path with one, chances are that it is now dead, defeated in an epic battle. Because otherwise, you would not be standing here. Proof this extraordinary feat with the eyestalk trophy, a conversation starter, and badge of honor for every intrepid adventurer. For a video tutorial on how to make this check out the companion post for this on Be Inspired with Dominic. For the culinary side of things, and thus loosely related to the felt version, is this recipe on Jabbado’s Kitchen about how to have eyestalk for dinner. And if that is not enough for you or not your style, there is an Instructable about this as well. I would say that if you have to ask you have come to the wrong place, but as a matter of fact, I can relate. Before I started making props and “in-game” pieces for our group, I really underestimated the impact they would have on gameplay. Not only do they serve as a physical reminder of things that happened (like trophies) or things that your character has (like props), they also make it easier to get into character faster which is something you should not underestimate. In the spirit of full disclosure, the main reason for making this particular trophy was that my wife asked me to. It was her character that had the idea to keep one, and in the spirit of “happy wife, happy life” there was no way for me not to oblige. Like I said above, you can find the making aspect of this project over on my other site. Here, I will go into the ways to obtain an eyestalk trophy inside your game world. If you are looking to make your own real-life version, you can find the template here for free! I would appreciate it if you also subscribed to my newsletter! This one is the obvious option, but quite hard since these beasts are dangerous and more than a match for anything but more advanced characters (if you encounter them in their lair, they alone have a challenge rating of 14, meaning that they can take a party of four characters at level 14 a ride for their money). In addition to that, going out to hunt for a Beholder can be tricky since they tend to be reclusive and seek to preserve their home turf advantage – which means that once the word spreads they will be ready for you and things are bound to get ugly. Another point here, and one often overlooked, is that it is one thing to defeat a many-eyed beast in combat. It is another to leave the eyestalks intact in the process. 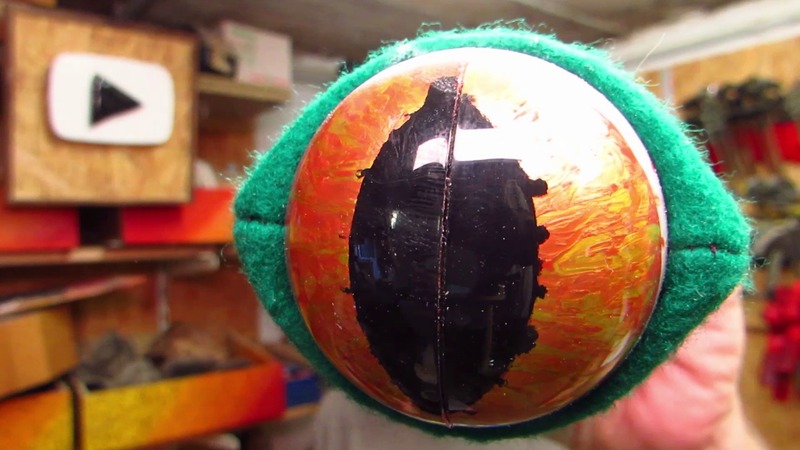 While a Beholder is plenty sturdy, each eyestalk on their own is not. Sharp weapons can be as devastating to them as blunt ones, and magic has its own array of ways in which to wreck a perfectly good trophy. Think acid or fireball, and you get the picture. Preserving the stalk is another problem that would-be trophy-hunters will face. Especially given the potential for arcane properties, body parts of magical beasts tend to have a rather short shelf-life unless they are treated accordingly. There are special containers used to keep such loot fresh (bag of colding, anyone?). There are also ways to enchant items to last despite their fragile nature. (For some of those options and maybe more, contact the Astralytes. They are always happy to help for a small fee). And yes, you could try and cleave one off of a live specimen, but I would not recommend that. Not just because of the inherent dangers of getting that up close and personal with a dangerous aberration, but also because it would not be the humane thing to do. While this option does not involve being devoured or repeatedly shot by nasty eye beams, the difficulties associated with hunting and preserving one outlined above still apply in a way. Eyestalk trophies are not cheap to come by. Most shops that offer them are in the more dangerous parts of the cosmos. In general, they are being run by worse things than Beholders, to begin with. As a rule of thumb, if you and your friends feel comfortable walking into a store where high-ranking fiends do their shopping, you are probably more than equipt to handle a many-eyed monstrosity, With the added benefit that the aberration will only try to kill you instead of trying to make a barter for your souls. If you really needed it to happen, there might be ways to obtain an eyestalk trophy by going through more powerful but less inclined middle-men. Asking for an eyestalk as a reward for some feat is always an option. But if the adventurer does not dare shop for one, do not expect the mayor of a mid-sized town on the material plane to it in their stead. Having an aberration’s eyestalk hanging from your belt is a good way to advertise your prowess, and can invite both praise and jealousy. If you carry it openly, chances are that sooner or later someone will challenge you for it. no matter their chances. On the other hand, it will go a long way in convincing would-be quest givers to take you seriously. The following ideas are always at the game master’s discretion. Most work as flavor options and should not affect the game’s rules at all, while some might constitute a magic item. … as a Weapon – this is as simple as hitting people over the head. Probably not as dangerous as a proper cudgel, but a lot fancier. … as Arcane Focus – casters that require an item to channel their magic through could use the eyestalk for that purpose, and possibly gain a bonus – either due to some arcane property of the eye focusing the magic somewhat or because pointing an aberrant eye at your enemies sure is disconcerting. … as Scrying Implement – rituals used to spy on others can benefit from the eyestalk’s inherent properties. Whether you use it like a telescope or not is up to you. But there is no better way to scry on someone than looking through the eyestalk of an all-seeing beast. … as a Wand – the eyestalk trophy could be used like a magic wand that allows you to cast a certain number of spell. This could be due to residual magic left in it after it parted ways with the rest of the body. Or through an enchantment after the fact, done by someone who wants to cast in style. On a side note: I decided to make the one for my wife’s character into a Wand of Friends (the 5e cantrip). I thought it was a good fit. … as Storage – you (or a more skilled craftsperson) can add a hidden compartment to it or turn it into a sheath for a dagger or a small quiver. A little more advanced and probably not food safe would be to turn the eyeball into a potion bottle. Do so at your own risk! While I go into a number of different ways to go about making an eyestalk trophy in this post and over on Instructables, I want to go into other uses for them in game here. Not for your characters, which I just covered, but other ways to encounter them in one fashion or another. Door (or Chest) Guard – bound by an arcane ritual both to life as well as a physical object, the eyestalk can, in modern terms, serve as a mix of security camera and facial recognition. It can remember or transmit what it sees and grant access to a certain group of people. In addition to that, it could serve as a defense mechanism using its inherent magic. Zombie Eyestalk – a creature in its own right. This could be the result of a wretched ritual. Or the remains of a Death Tyrant, severed from its body but refusing to die (again). Whether it retains the ability to hover or has to creep along like a worm, it will in all likelihood have some kind of eye beam magic to defend itself. It would be like making a Beholder with the eyestalks spread throughout the room – even behind the furniture. Door Handle – less of the arcane and more of the taxidermic persuasion is the eyestalk door handle. Nothing says “you are entering the house of an accomplished adventurer (or a decadent high elf noble)” like a dried up, preserved eyestalk mounted on two brass plates serving as a door handle. It would fit right in with a “big game hunter” style decor. 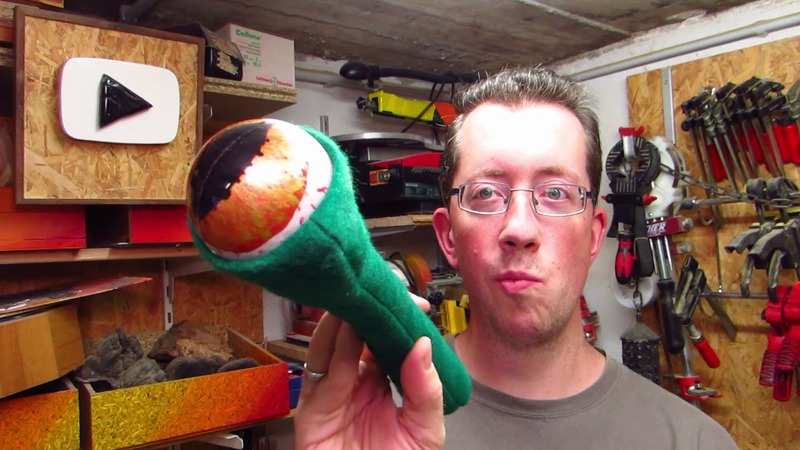 If you like the Eyestalk Trophy and make your own please send me pictures and let me know how you are going to use it! I would really appreciate hearing from you! I have not documented much of what I have made for my roleplaying group, but for now, you can get an idea of what I do over on Be Inspired with Dominic. There are also a some paper models and a growing number of posts to give you ideas for roleplaying around here.